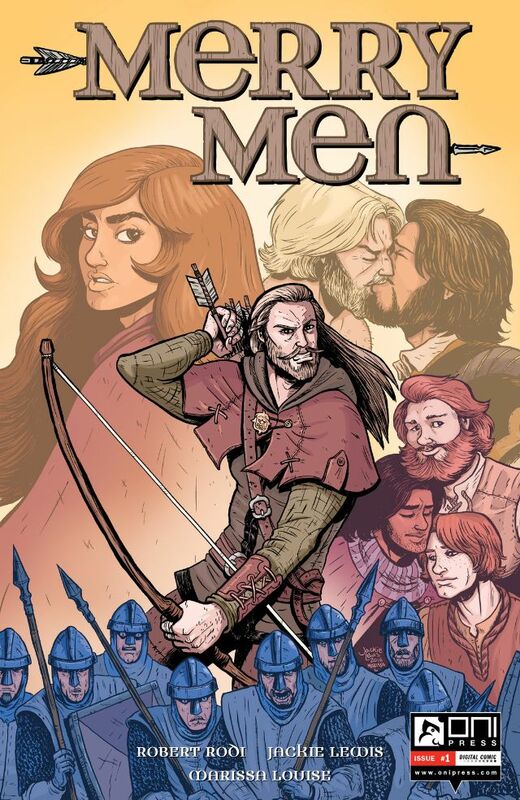 With a title like Merry Men, my thoughts are drawn to Robin Hood and Little John running through the forest or perhaps even a wicked Sheriff of Nottingham attempting major organ removal with cutlery. The risk of retelling such a well known story was always going to be a tough sell; the writer would need a hook something to grab the readers attention and as I stared upon the cover the ‘twist’ of tale is broadcast in bold lines and vibrant colours. This Robin’s men are all very merry with each other; intimately so. This is Robin Hood but not as we know him. This Robin is gay. Curiously I begin to flick through the pages taking in the artwork of each panel of a story being told in a bold new direction. The introduction of the characters and the relationship threads which bind them are thrust upon the reader before the story even starts and sadly we are robbed of the joy of getting to know these newly defined heroes. The story itself tries to gain momentum as the pages fly by, with subtle nods to this being a merry ‘fellowship’; there is even reference to Robin being a ‘Prince of Thieves’. All tricks to stimulate the readers association of this Robin to that which we have grown up with. The artwork and illustrations compliment a story that for me is trying to be too clever and edgy for its own good. The pictures are drawn cleanly and the panels are free from clutter; the bad guys are drawn like nightmares of Disney villains gone by and the good guys look like they have walked off the pages of GQ. The story leaves a trail of breadcrumbs for the reader to follow what is to come next and to the history between Robin and his legendary nemesis. Yet I cant help but compare it with Outlander by Diana Gabaldon, which introduces a masculine but sexually ambiguous character with an agenda and a gut wrenching viciousness that this Robin can only dream of. In conclusion, I truly hope that in the future this story slows down and begins to develop the characters beyond that of a camp caricature as I really want to enjoy this tale. I started reading this story hoping for a “Prince of Thieves” Robin Hood who happens to be gay but I wound up with Robin Hood: A Gay Prince who might be thief.